The Centre County Grange Fair and Encampment is the biggest event of the summer, if not the whole year for Centre County residents. 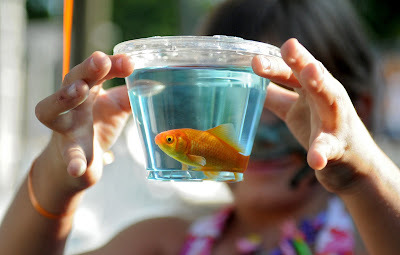 In the first day I was at the fair I learned that grange tents are a popular topic in divorce custody battles, some claim bigger then kids, and that most take their vacation to spend the week at the fair. The first day I went out to cover the fair was move-in day. I wasn't exactly sure what this meant when I left for the fair grounds but quickly learned that people build kitchens and porches onto their tents, and literally move in for the week. Futons, beds, tables, some even have tvs and ceiling fans. Soon after I got to the fair grounds they announced that a severe storm was coming through and for everyone to be in their cars or to go to buildings around grounds. I hide in a bathhouse with one other woman as it rained and rained, and hailed, and the winds blew. Once the storm finally passed I knew my photo would be the people still setting up with inches of water on the ground. 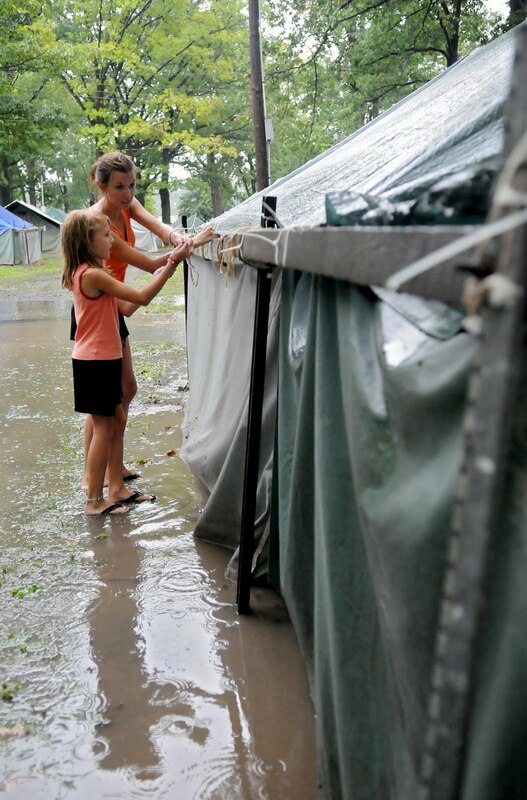 This woman and her daughter worked to tie a tarp over their families tent, so the rain wouldn't soak through. When I headed back to the fair on it's officially opening day I did a big loop of the grounds to learn where some things were. The crowds started to come in as the dinner hour approached. The first night of the fair is also the Annual Grange Fair Queen pageant. I learned a lot about the fair and how important it was to the contestants, and most of the fairs attendees, from the girls speeches. When the new queen was announced she jumped up in excitement to hug the former queen, who happened to be her big sister. Before the queen pageant I had walked by an RV with a bunch of folding chairs set up around a TV. I knew what that was for and headed back to that RV after the queen was announced to found a group of people watching the Keystone team in the Little League World Series. The owners of the RV joked they needed a bigger TV and mentioned their daughter attends school with some of the players. The fair brings families, animals, and politicians. Governor Corbett visited on Friday afternoon and was given a tour of the new equine arena before heading to the republican stand on the midway. He must have joked at least 5 time that he wished he could find a team to build bridges as fast as the team that built this new arena. This little girl and her family stopped to talk to the governor, but she was much more interested in showing off the fish she had just won than talking to a politician. With families all brought together at the fair, any special occasion is celebrated at the families tent. Raynee enjoyed playing with the icing of her cake as she celebrated her first birthday outside of her great-grandmothers tent. Animals are a huge part of the fair, with the 4H and FFA competitions and selling process, but most of those events take place earlier in the day so I wasn't able to cover them. I did loop through the animal barns one day though, and for some reason find goats to be very fun to photograph. Throughout the week we featured a different tent everyday. Each tent has a unique story and family history built into it. In this families tent they used to sing country tunes in the grandstand when the two brothers were kids. It was an interesting experience to cover the fair, some days I dreaded it, and some days I looked forward to it. 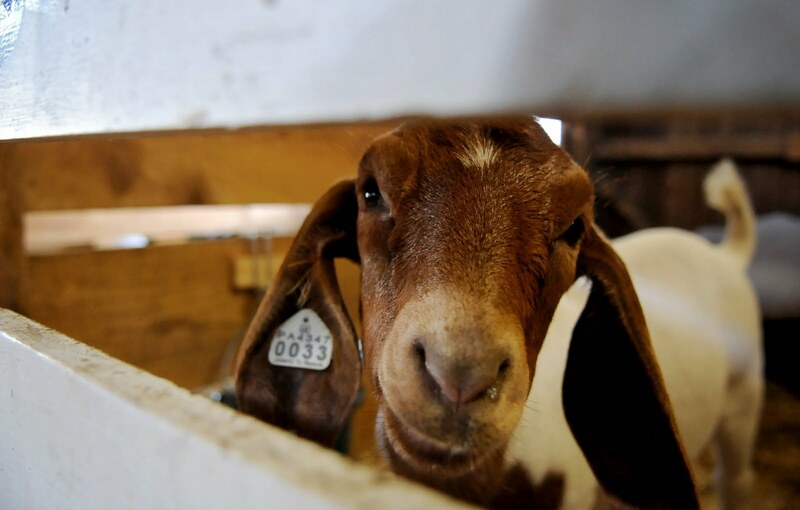 The history and stories that go with the Centre County Grange fair are entertaining, and the people are so friendly that it makes my job a little easier. I know understand what all the hype is, and until next year, I'm Granged out.